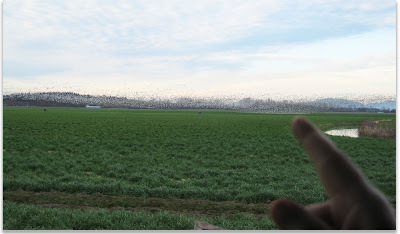 Sidereal Day: Holy Cow that's a lot of Geese! Holy Cow that's a lot of Geese! 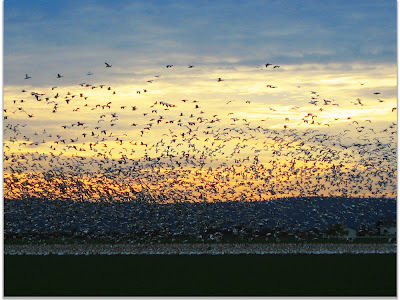 It's Snow Goose season here in the Skagit Valley. Every year they stop by here on their way to wherever they are going and hang out for a while. There are a few places here they like to congregate, some of them are have been set up as wildlife preserves, and others are farms. I went to see them with my parents a few years ago, it is impressive to see the sheer numbers but most of the time they are just sitting around, eating worms, doing goose type stuff. I'm not much of a bird watcher, but can appreciate a pretty bird when I see it. I put this one up just to show the sheer number of birds, I couldn't get them all in the frame. I did manage to get my husbands finger though. If you look closely there are a few people out in the field right under the birds (maybe why they took off) It would be an amazing vantage point but way more likely to get pooped on than from our view from the car. They flew right over our car and landed in a field on the other side of the road...just to give me a nice shot with the sunset in the background. Also, my prize arrived from the OWOH event. I won a lovely ATC made by Rein at Stamping Rika. Thank you Rein!